At this time we are taking an extreme amount of emails after being televised on CNN and NBC News! We will try to answer your questions in a timely fashion. Answer: To continue the phase of project we are now at is $700,000. The complete project estimated cost is 20 million dollars. The Flex Fuel Chip and the Variable Displacement will help offset the funds needed. Please let me first congratulate you on a remarkable design and use of technology. What you have is exactly what Americans and people around the world need. I say "people" because indeed every person that drives an automobile needs your product, an incredibly efficient motor/engine in their vehicle. However, I imagine there are many corporations that do not want your technology available to every person. How do you get your technology and product available to the general public without getting corporations involved? How much capital do you need to continue on with production? Could you possibly take out advertisements in newspapers, online and in periodicals asking for public investing into your company, leaving corporations out? I am very confident the general public would readily invest in your company if they just were informed of your technology. Unfortunately, this country is controlled too much by big corporations. I believe you may want to try to reach those that made this country great, the people. Most of us (by us I mean Americans with a sense of pride and a sense that we need to take control of things that matter to us and not let the greedy corporations and politicians control our livelihoods) understand the overwhelming need for your product, we want it. Please do not put your technology "on a shelf". Let the people have the opportunity to help. We do not need corporations or the government to do this. We can do it together! If you decide to try to get personal investors, please let me know. I will certainly invest my money and volunteer my time to promote your technology. Question: 7 04,2009- How is your patent process on the HP2g™ engine coming ? We are now working to get International Patents for the HP2g engine. Comment: Judson from Leslie,MI - I hope the guys at Revenge have a big assembly plant, because once you get a little bit of major press, and advertising your cars are going to out sell all the other brands combined! 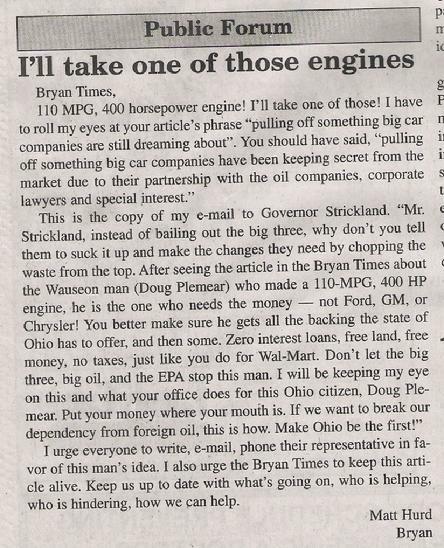 Comment: Todd from Perrysburg, OH - Too bad the "Big 3" w/all their problems wouldn't scrape their last dimes together & buy the design so they could have 50-100mpg autos & still run the big power. Comment: Tami from PA writes - Gramps says that your engine sounds wonderful and he is waiting for more details when you release more information. He said he has a lot of questions too but figures you would not tell cause it's secret stuff. I hope all is well with you it sounds like your engine is really working out well and will be a great thing to many of us when you get to the point of selling the stuff so we can buy it! Comment: Marti from Orgen State - I am super happy for you that things are going so good with the HP2g Engine and that is such great news about Car Company Contract. Comment: Heather from Toledo, OH - It's great what your doing! What does it do in the quarter? Comment: Dana from Pittsburg, PA - Well, first off, you're pretty much my hero for what you've been able to do with the entire freaking world! Comment: Jim from Harrisburg, PA - 110 mpg that would be incredible. Like I said Good Luck to both of you ( HP2g and Revenge ). Comment: Bud from McLean,VA - Looks like you've got a winner! Comment: Chris from Goshen,IN - I'm praying and crossing my fingers for you Doug. I'm excited to see the potential uses for what you've designed. I'll finally be able to afford to drive a truck. Q. Hildagar from Austin, Texas asked --- Does it run on a flux capacitor? A. HG2g Team -- Sorry No that is in the movie, but we would like a car like that! Q. DeAnn fromWYOMING, Minnesota --- When can we see this technololgy be for sale? A. HP2g Team --- Very soon if our fuel prices continue to raise. Q. Rick from Kalamazoo,MI--- When can we see your car displayed? Q. Cory from Toledo, Ohio--- How did your fuel saving idea start? A. Here is a great saying: All things start as a dream. All dreams start as a plan. All plans consist of thought out steps. All steps are not without a price. Dream, plan, pay the price – do it! Q. John from Las Vegas, NV --- Where can I buy your engine? Q. from protect_democracy " Bush better liberate Napoleon, Ohio. This man has weapons of mass destruction." A. Thanks "This is the Best Ever "
Letter wrote in by Speedzzter: I have no idea whether Team HP2g will be able to make good on their claims or not. However, it does absolutely no good to ridicule the team before the competition has even started. If one believes the future of private transportation is only soulless, cramped telephone-booths-on-wheels, powered by permanently-sealed "black box" propulsion units, then perhaps "a drag race" is irrelevant. But, the fundamental idea of the X Prize isn't just to build the most compromised and highest m.p.g. vehicle possible. It's about building cars with "real world" attributes AND advanced operational efficiency. In the real world, there are people who want increased "part throttle" fuel efficiency, yet still need (or want) serious power during 3%-5% of the driving cycle. There are people who will continue to need light vehicles that retain the occasional capacity to haul heavy loads of goods and equipment at highway speeds. There are people who will never surrender motoring enjoyment and performance capability at the "altar" of m.p.g. There are still people who desire dual purpose cars that can be driven daily and raced on the weekends. Drag racing is a well-documented way to demonstrate the peak output and durability of an engine. It can demonstrate an important part of an engine's capability to the technologically-aware segment of the motoring public. It can also generate interest in a new concept or idea. A 100 year tradition of automobile racing and "hot rodding" isn't just going to evaporate because a minority of power-hungry environmentalist-socialists are spreading their new global religion of "climate change." Thus, whatever happens, some of us will still be racing whatever there is left to race. The X-Prize would be a total failure if it degenerates into a ephemeral competition between flimsy, freakish and impractical experimental "cars" that do nothing well but sip fuel. At least Team HP2g has entered a vehicle with "real world" attributes of interest to the millions who don't plan on giving up the essence of high performance motoring merely to appease the greeniacs. I hope they can meet and even exceed their claims . . . and do it with a V8! But it does no good to "trash talk" against them until they've had their day in the actual competition. "Real progress requires continuing to 'push the envelope.' It requires continuing to press for greater subjective and objective performance." Letter wrote in by Jesse Livefast : " First off, I would like to reiterate what I said in the subject. Thank you! And secondly, and I don't mean to accuse you of anything, but I sure as hell hope this is real; tangible. I know you have a lot riding on this, and I hope more than anything that you win and garner the respect and wealth that will come with the win. I hope you're not pulling our leg, because as a little grass roots effort, you've inspired a lot of people, including myself. You're all over the Mustang forums, Subaru forums, and I just introduced your team to a Nissan/Infiniti forum that has been buzzing ever since I posted your video and articles. From a performance driven mind, I'm excited to see what your team has rolling over there, and as a middle class American, I'm excited to possibly buy whatever it is you're selling. So many people have speculated that you're going to sell out to the big wigs, deal with the automobile manufacturers, or go another route that so many have followed for money, but I'm almost willing to put money on you guys! It's about time that we have a true great American "David" to slay the corrupt OPEC "Goliath!" Whether you win this thing or not, you have inspired thousands, if not millions at this point! Keep up the good fight! Break our shackles, will ya?!" A. No... Thank you . We are testing and proving our products in real world driving. I urge everyone to write, e-mail, phone their representative in favor of this man’s idea. I also urge the Bryan Times to keep this article alive. Keep us up to date with what’s going on, who is helping, who is hindering, how we can help. Thank you for contacting me regarding the proposed bailout of the auto industry. In my judgment, the Big Three automakers have arrived at this point through their own poor management. The fact that so many American manufacturing jobs are at risk is the only reason these companies deserve any taxpayer assistance. In order to avoid digging ourselves into a deeper economic hole, we must take action. But we cannot simply have another bailout. Any assistance from the government must come in the form of a loan with significant strings attached to force these companies to restructure the way they do business. First, we must insist that the Big Three increase their average fuel economy to 50 miles per gallon by 2020. Automakers must also increase production of flex-fuel, electric and plug-in hybrid vehicles. Foreign car companies have been building fuel-efficient cars for years, and now in this era of volatile gas prices, the American manufactures find themselves at a disadvantage. We also must ensure that no tax payer money goes to reward the people who got us in this situation in the first place. Shareholders in these companies should not receive dividends until the companies return to financial health. We must place limits on executive compensation and eliminate golden parachutes. Finally, we must insist that these companies replace their senior management. We need new leadership and fresh ideas to get us out of this mess. I appreciate the time you’ve taken to contact me about this important issue. I am committed to keeping America on the leading edge of manufacturing and technological innovation. Please do not hesitate to share your views with me in the future. Thank you for contacting my office. I appreciate you taking time to share your thoughts. Horse Power Sales Net, Inc. Thank you for contacting the office of Governor John H. Lynch with information on your company. Thank you again for sharing your thought with the Governor’s office. Please do not hesitate to contact our office with our ideas or if we can be further assistance. Thank you for writing to share your thoughts on your company Horse Power Sales Net, Inc / HP2g. I appreciate your suggestions on promoting alternative fuel transportation in California. Our state, nation and world are facing unprecedented challenges not only from global climate change, but from increasing energy prices and dependence on unstable governments to supply our fuel. Fossil fuels damage our environment and are becoming increasingly unsustainable. We must begin to look toward methods of alternative fuel transportation. While we have a huge undertaking in front of us, I know that through the unparalleled innovation of Californians, we will readily meet and challenge before us. Just look at what we’ve accomplished so far. In January 2007, I announced the world’s first Low Carbon Fuel Standard for transportation fuels. This First-of-its kind standard will reduce the carbon intensity of California’s transportation fuels by at least 10 percent by 2020 and more thereafter- the equivalent of removing 3 million cars from the road- while spurring the advancement of alternative fuels. Our zero Emission Vehicle Program has also instrumental in promoting the use of clean gasoline technologies- such as hybrid vehicles- and encouraging the development of pure zero-emission technologies. Today, Californians are leading the way in promoting alternative fuel technology and other green business and renewable energy fields. That’s why I know that if we remain committed we will succeed. We will show the world that protecting the environment and growing the economy go hand-in-hand. Again thank you for your interest in alternative fuels. As we continue out efforts on this important issue, I will keep your thoughts in mind. Thank you for sharing your enthusiasm for electric cars and your hp2g design. I apologize for the delay in my response. A sound and sustainable energy policy must be a national priority as we seek to lessen the impact of climate change and secure our energy independence. Ohio has the potential to be a leader in the alternative energy sector, and I am confident that ingenuity, a hallmark of our state, will ensure that this happens. I appreciated hearing about your project and ideas. If you are looking for government benefits, you should consider visiting www.govbenefits.gov, a partnership of federal agencies that provides personalized access to government assistance programs. GovBenefits.gov will help you to determine if there are government programs available to assist you. In addition, please visit my website, www.brown.senate.gov, for more information on energy grants and tax breaks made available through the American Recovery and Reinvestment Act. You may also wish to call the Department of Energy Recovery Act Clearinghouse for more information about federal assistance for energy projects. That number is 1-888-DOE-RCVY. Please feel free to contact my office if we can assist you with any other matters involving the federal government and its agencies. Thank you again for getting in touch with me. Thank you again for writing, and I will keep your thoughts in mind as the Senate continues to pursue sound environmental and energy policy.